Student survival guide: electricity and gas bills - Which? How do I find out my energy supplier/s? How do I pay my energy bills? Can I change gas or electricity supplier? How do I switch gas and electricity supplier? Read your gas meter and electricity meter as soon as you can, and write down the readings you see. You'll need to give these to your energy company so you're only charged for the power you use (and not what the previous tenants used). Contact the companies that supply gas and electricity to your property to register that you're living at that address, choose your energy tariff and set up payment. It might also be a good time to compare tariffs and switch to a cheaper energy supplier. If you're renting a house, check outside the property for a cabinet or meter box. Sometimes you'll find your meter in the hallway, kitchen or in a cupboard under the stairs. If you're renting a flat, try these or the communal hallway too. If your search is unsuccessful, your landlord, letting agent or inventory should also be able to tell you where your meters are located. Work out which one you have with our guide to gas and electricity meters. To read your energy meter, simply write down the numbers you see, from left to right. You can ignore any red numbers or dials. If your meter isn't clear, check out our guides to reading your gas meter and reading your electricity meter. If your electricity meter has two sets of numbers (labelled normal and low, or day and night), this is an Economy 7 meter (or a 'white meter'). This charges different rates for electricity you use depending on the time of day, usually charging a lower rate overnight. You might have a prepayment meter, for which you'll often need a key or card to top this up – find out how to top this up, below. Note, not all homes have gas meters; some may work with electric heating, for instance. It will often say in your rental contract who your energy supplier is. You can also ask your landlord or letting agent when moving in, or check if you receive any letters from your gas and electricity supplier addressed to ‘the occupier’. Alternatively, you can find out both your energy suppliers by entering your postcode into the Energy Networks Association’s tool and getting the relevant contact information there. To find out your gas supplier, you can also call the meter number helpline on 0870 608 1524 (calls cost 7p/min plus your network access fee). You may be asked whether you want to pay monthly or quarterly. More frequent payments can help you to budget effectively (and avoid that awful feeling of seeing a big sum of money disappear from your account in one go). If you have a prepayment meter, you will need to pay in advance for the gas or electricity you use, topping up as you go. Some companies let you do this online; others will require you to take your key or card to a local shop or the Post Office to top up. How should we split the bills in our student house? Sit down with your housemates to decide the best way for everyone to pay their share of the energy bill. A lot of the time you'll need to have the bill in one person's name, with that person paying the whole bill and everyone transferring them their split. If you have a prepayment meter, you could take it in turns to top it up. Decide the best way that suits everyone; this will depend on how well you know your housemates, how reliable they are, how often you see each other and so on. You might want to try a bill-splitting app or mobile banking app like Monzo to help you keep track of your money and what everyone owes, plus make transfers easily. Alternatively, a shared Google doc or spreadsheet will do the job. Cook together: use the oven or hobs to cook one big meal for everyone, rather than all using them separately. Replace your lightbulbs with energy efficient LEDs when they blow. The cheapest only cost around £2. Cut draughts around windows and doors using draught-proofing strips (or an old-fashioned draught-excluder). If you have an unused fireplace, use an inflatable pillow to block the chimney. Only run the washing machine or dishwasher when they're full (although be careful not to overpack your washing machine). Dry your clothes outdoors if you can, rather than using a tumble dryer. Tumble dryers can cost as much as £100 a year to run. Can I change gas or electricity supplier as a tenant? If you pay your energy company directly for your gas and electricity, then you can choose your energy supplier (that's set out in consumer protection law). If your landlord pays the bill (you have 'bills included' in your rent, for example), they can choose the energy supplier. Check your tenancy agreement if you pay the bills. 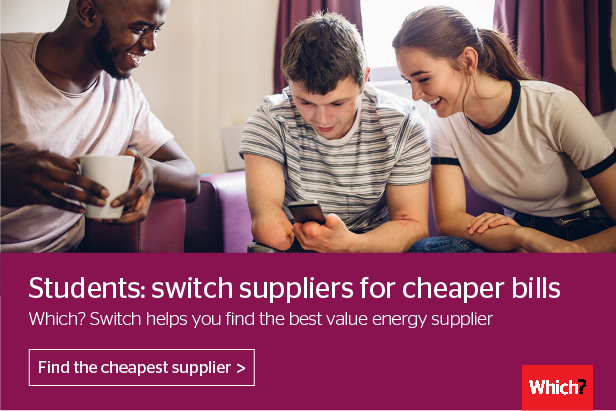 It might include a 'default' energy supplier, or say that you must tell your landlord if you change supplier, or that you must switch back to the original supplier when you move out. It's good practice to tell your landlord if you change the energy supplier, too. Use an energy price comparison website, like our independent and free Which? Switch, to compare gas and electricity prices. This will show you how much you could save, before you make a decision. Enter the date your tenancy ends to see the prices for the amount of time you'll be living in the property; student rental agreements are often shorter than those for non-students, so this is important to do. Grab a cup of tea as you go through the online process. This should only take around 15 minutes if you have all these details to hand. The actual switchover takes about 30 days to complete (a week less if the company is signed up to a guarantee). * Data is from Energylinx. Prices are based on nine months (Nov-Aug 2017) for an average energy user in London (using Ofgem averages of 3,100kWh electricity and 12,000kWh gas per year), paying by direct debit with paperless bills. The saving is the difference between the priciest Big Six standard tariff (Npower) and the cheapest tariff on the market on 10 Nov 2017. Prices vary by region and payment method.